Well, we returned from Florida to our house last night--which doesn't have heat, for some reason...so, I'm waiting to hear from the nice furnace repairman. 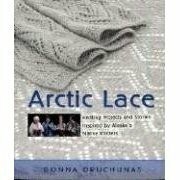 However, in the meanwhile, it puts me in a perfect mood to talk about Arctic Lace, Donna Druchunas' new book. When Donna Druchunas gave me the chance to be a part of her Arctic Lace blog tour, I jumped at it. My reasoning was shallow—Finally, a way to figure out what to do with the qiviut! When the biologist husband went to Alaska for a conference; he came home with the ultimate spinner’s gift. A quantity of raw qiviut, straight from the Large Animal Research Station in Fairbanks is too precious to waste—I’d been waiting for inspiration. What’s most special about this book is how it allows knitters and fibery folk to explore Alaska--to be armchair anthropologists. No only do we learn about a fascinating animal, the musk ox, a knitting cooperative, and its designs and techniques, this book accesses a part of Alaskan rural culture that is unavailable to most of us. Donna sensitively explores the issues that Native Alaskans, Yup’ik and Inupiat Eskimos, face in a fast evolving culture. How to earn money now that native foods and the native lifestyles are changing? What to do about the fast-melting permafrost that affects (and even floods) villages? How does one explain a native culture to tourists who never even visit rural villages? How does knitting fit into these lives? The Oomingmak Musk Ox Producers’ Co-operative created a tenuously balanced way, dependent on varying amounts of Qiviut grown each year, for Native Alaskan knitters to earn money while maintaining their rural lives. Donna Druchunas writes about the story of the co-op, and a little about the knitters, without compromising their privacy. In Alaska, visitors fly into rural areas by small plane. There aren’t guest rooms or hotels, or even indoor plumbing. These places aren’t accessible to the average tourist, nor would I want them to be. To me, the best knitting books aren’t just filled with patterns, but with stories that keep us thinking while the patterns grow beneath our fingers. Donna’s book, Arctic Lace, gives just that chance and it’s worth every penny. 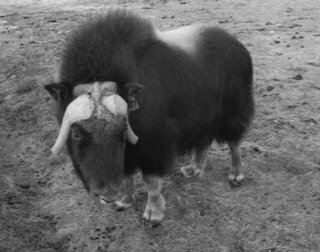 Invest in people who write thoughtful, intelligent knitting history as well as patterns…and invest in the future of musk oxen, qiviut and the chance for Native Alaskans to support themselves and their environment in the future. Knit luxury fibers just once. 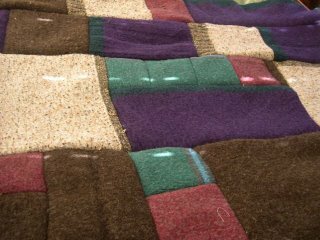 Knit Qiviut. I'll end this post by pointing out that I'm sure I'd feel warmer just now if I already had a qiviut lace scarf or shawl made! This should motivate me for the next time I'm huddled by the space heater! All new! Get your sweaters here! At long last, I am able to announce that Knit Picks has published the sweater jackets to their website and...I hear, others have seen these sweaters in their catalogs. I even got a wonderful note from Zeila! Thanks, Zeila! These sweaters, Cocoa Butter Rose, Plum Ribbed Cardigan and the Wrap-Around Cardigan are how I spent a good bit of the summer...sweating as I designed all those inches of warming wool and wool/alpaca or wool/cotton. I hope you like them! 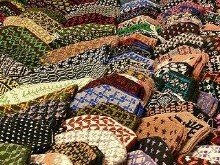 Hop over to Knitpicks.com and take a look! Oh, I think the explorers may just have returned from their day in the Florida wilds! I'll get back to y'all (with links and photos?) in a few days. 1) Oatmeal sweater--color looked bad, neckline was worse, and the velvety nubbly bits kept pulling out, making it unsuitable to give away. 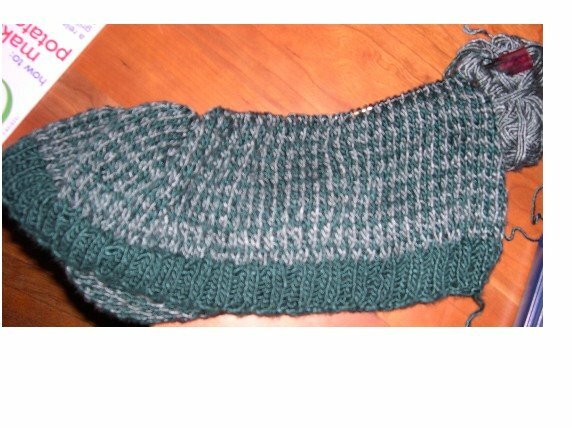 I knit this at least 5 years ago. 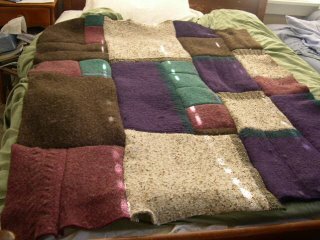 2) Purple and green sweater-knit for brother while we were in college. Perhaps 1994? He never wore it, loaned it to a frat. brother. The sweater mysteriously turned up in my parents' guestroom closet years later. I took it home, and wore it for too long. It's a man's large, it was always too big and hairy for me. Never even came close to fitting the very large husband. 3) Brown sweater--you can see it here under the "seeing things differently" post. I never did get more wear out of it by turning it inside out. What was I thinking? This was one of my first handspun, handknit sweater size creations that I completed from start to finish, somewhere in the mid-90's. I cut off the buttons to use again. Hey! They were good buttons! 4) Light green sweater with stripes at the yoke. My mommy made me this sweater out ofFingerlakes Unspun . I loved it to death, including shredding the backside hem. It went under my backside once too often. 5) Cranberry sweater also knit out of Fingerlakes Unspun by my mommy. She really loved me back then in the knitting department. This one had a cable up the middle. It pilled a lot. Just as a hint--this unspun stuff was so soft, felted well, and did NOT wear like iron. Had both of these mommy-knit sweaters for at least 11 years of use, I think. Now, there's room in the cedar chest for more sweaters! 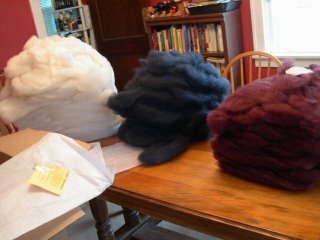 The nice UPS man brought these lovely rovings to me from Stonehedge Fiber Mill on Thursday. They arrived a week after I sent the fleeces to be carded. No kidding. Wow! What service... The next box is coming soon, I hear. Pictured below: one white Border Cheviot Fleece, a little over a pound each of blue and cranberry dyed Cotswold wool. This was the Cotswold that I mentioned earlier, that varied from cotton candy to black cherry in color when I dyed it. Doesn't it look luscious now!? 1. Feminism has given me a voice. By this, I mean I can speak out if something upsets me or makes me happy. I can vote. I can write on important issues and be seen as a valid contributor, regardless of my gender. I can be an activist for the things I care about. 2. Equality under law... As a woman in the U.S.A., I am entitled to be judged by the same laws as a man...and be treated equally. 3. Equal pay. Equal pay is an ideal for me...the concept of equal pay for equal work is something that feminism introduced to us as a reasonable possibility. Unfortunately, it still isn't reality for many, if not most, women. The latest statistics I've found here indicate that as of 2004, women still earn 76 cents to the dollar earned by men. Theoretically, if a woman is educated, works hard, etc. and doesn't take any time off for childrearing, she should be able to earn what a man in the same position earns. I'm educated, haven't managed to have children, and I think I work hard. For me, this equal pay notion is still an ideal--since I chose to get married (thus limiting my job opportunities by chosing to live with my spouse and not near the best jobs) I have earned consistently less than when I was single. I dream one day of having children, of staying married, and earning a decent wage while working full time at something that I enjoy. It hasn't happened yet. 4. Feminism has given me a "room of my own." Yes, I'm referring to Virginia Woolf's book's premise and beyond, to her book, Three Guineas. In order to create, to contribute productively to society, one needs education, professional opportunities, money, and even quiet--that space and room in which to blossom as a thinker. I feel lucky that, unlike Jane Austen, who had to write in the midst of her family's parlor and hide her work on occasion, I have been given a great education and literally, a whole room of my own. It's messy, it's full, and it's the place where I do most of my creative work. Without feminism and its great thinker,Virginia Woolf, neither I nor my partner could dream that I needed this special space to work. 5. Feminism has given me my own name. I'm allowed to be a Ms. I don't have to be Dr. first name husband, last name husband. I never have to be identified as Married Woman. (Mrs.) husband's name. I published writing with the name I was given at birth...and didn't have to lose that when I married because of a name change. I've never been obligated to change that name, and for that, I'm grateful. For many women, they don't see this as a sign of identity, or they don't feel the loss of that identity through the name change, but for me, my name is very much a sign of my identity, my family background, and I'm glad I didn't have to drop it for someone else's. Just because I love my partner doesn't mean I should have to lose my identity, in any way, to his. While this doesn't fit exactly into the biggest issues, I'm also grateful that I'm a feminist at a time when I can do things seen as traditionally "women's work" and be seen as a professional. My hope is that by doing my best professional work as a knitwear designer, a writer and as an educator, I can make this work important--not because it is "female" work, but because, regardless of gender, it's good work. It's a goal to work for. Here's a photo of those Latvian mittens, created for the NATO summit, that I mentioned before. This is a great example of the "raising up" of traditional women's work to celebrate ethnicity, tradition, and an important world event...it's a feminist statement...and an inspiration. I'm often asked where I get my ideas, and the answer? Everywhere. Each new experience offers me riches, if I can take the time to mine it for meaning and understanding. If this weren't inspiration enough, I did some travelling this weekend, which I always find stimulating. We went to Dallas for a wedding at the Dallas Arboretum (gorgeous place) and to see friends. The groom was a schoolmate of my husband's and a chance for him to see a several dear childhood friends. They were all interesting, wonderful people and it was a great experience. Since we don't have a satisfyingly large used bookstore locally, on Sunday we got to visit a huge used bookstore before getting back on the airplanes home. I loaded up on goodies, an audio book on CD by Monica Ali, a novel or two, a knitting book, ... lovely treats for later. I'm heartened by the notion that most Jewish theology doesn't focus on, or believe in, the conventional Western version of hell, so her words, probably intended as a curse, didn't leave much of an impression. Not all the experiences are positive, but it all comes together in the things I create eventually. At home, I have to take time to assimilate experiences before I write or design about them. It takes me a lot of processing time...and I'm often tired out by all the social interactions. Today it's rainy and cold outside, I'm making turkey vegetable soup and homemade wheat bread for dinner, and I'm thinking... so, where do you get inspiration? What do you do with all the input the world gives you? How do you take time to think about it and turn it into meaning? Welcome to our Sukkah! On Friday night, we started celebrating outside! 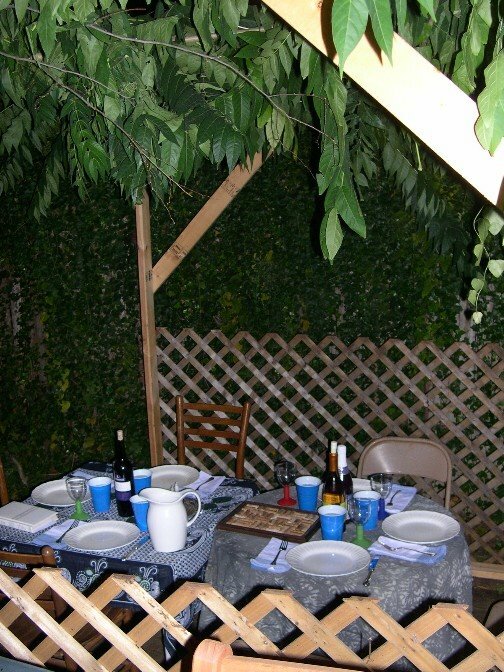 On Sukkot (here's another link to explain this harvest holiday, if you're interested), it's traditional to invite guests to eat, drink, and celebrate outside. We had a big dinner party, with as many guests as would fit inside our sukkah (4, plus us and two dogs) and ate a warming beef and vegetable stew, couscous, green beans with a walnut viniagrette, challah, wine or juice, and for dessert, an apple crumb pie. It was a great party on a crisp clear night, with a huge harvest moon. As a result of the lovely fall weather, I've been doing lots of sniffling, coughing, and otherwise acknowledging the joys of ragweed season. This has limited my outdoor time during the holiday, but not my fun! I got a special treat sent to me from Sarah in England, of Carpe Diem! fame. You see, I admired Sarah's lace shawl, knit of pearl sea silk yarn. She said, no problem, I have extra, I'll share! As you can see, I was so stunned by her generosity that I had to show it off. 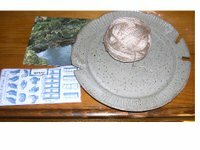 Not just a bit of yarn odds and ends, but a subtle pearl/gray/cream silk, a great handmade pottery plate filled with whimsy (can you see the flounder? The biologist husband smiled and pointed it out right away, )and... a bar of organic lavender milk chocolate! What a gift. It made me stop sniffling for several minutes as I admired everything. Sarah, how did you know we love whimsical pottery and chocolate around here? Finally, I should acknowledge that I did really spend hours grousing on the couch because of the allergies. I was really bad at maintaining the grumpy part for long, though, because I started working on this silk, slip-stitch dress top in between coughs. (notice the silk theme?) Several years ago, my brother-in-law took me to a neighborhood yarn shop in Sarasota, Florida when I was visiting. I found a long ago discontinued Anny Blatt yarn from France, 100% silk, on sale, in these two shades of teal. I hope it will become something lovely to wear to weddings and other festivities; I'm making it up as I go along. It is indulgent just to touch it, and makes a scrunching crunch as I knit. For the technically minded out there, It's knit on #6 needles, (4mm), in the round, and I've knit over 9 inches since Saturday. It's that good. Reminds me of a luscious cup of French hot chocolate, but it's fewer calories. I'm bad at keeping secrets, especially when it's exciting news...it's hard to hold it in. Many times, I'm asked not to show images of designs or talk about articles until they're published and that's so hard! However, now that Vogue Knitting has published its Holiday issue Table of Contents, the cat's out of the bag. 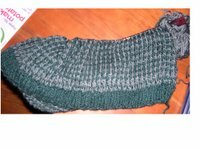 Check out this link to Vogue Knitting and scroll down to look at the left side of the page. Yup, that's my article there. I'm just about quivering! I feel as though I've hit the big time...(in the knitting world, that is) On the newsstand October 17th! 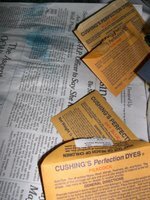 Several people have emailed or sent comments to me about the marigold dyeing--thank you! I hope I've answered all your questions. Now I wanted to celebrate this big milestone in my knitting/writing life with you. 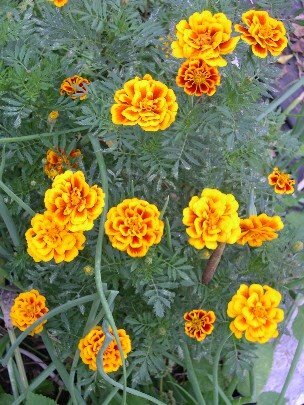 We planted marigolds in the garden to help ward off bugs, and it might have worked. (I mean, think of how much worse the bugs would have been if we hadn't planted them!) However, since I'm a fiber junkie, I couldn't just imagine planting marigolds for their pyrethrin. Oh no. So, on Friday, I threw those Cotswold/silk worsted weight single yarns into the marigold golden dyepot. 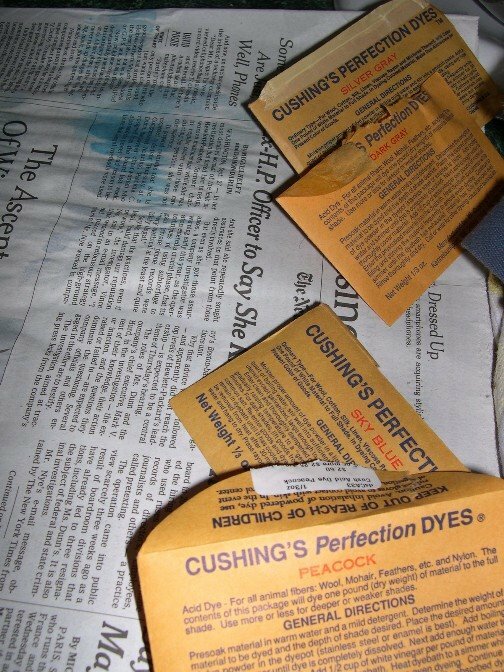 I also used two packets of garnet colored dye, Putnam brand, for the curious. I am just itching to start knitting with this stuff. I haven't decided on a stranded knitted pattern or a slip-stitch one yet, but I see a v-neck garnet sweater with yellow twining patterns up the body, with matching cuffs in my future...or at least in my daydream knitting! The yellow marigold dye is really rich and happy looking, even if it's a bit washed out in these photos. For those who've seen my car, well, it's not that yellow, but it is a cheery shade. The bit of fluff you see there is part of that caramel/gray fleece that I showed in the last post. 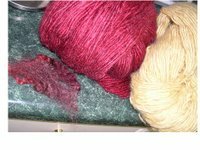 This 1 lb bit is now dyed everything from black cherry to dusty pink, in fabulous variegated style. I used the same garnet dye as on the white Cotswold/silk yarn. 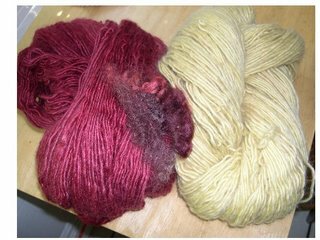 Now I just have to dye the rest of the fleece, and all the lovely colors will be sent off to the processors for picking and carding. I have my eye on silver and green for the rest of the fleece, but if you have other color coordinating ideas, let me know...if I have the color in my stash, I'm happy to have suggestions for the dyepot. Who knows what I'll get with such a dark and rich fleece? 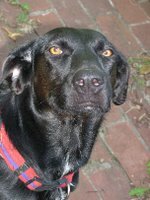 Heck, please leave a comment even if you don't have a yen for color! Every so often, I get an email, but in general, my readers are a secretive bunch. I'd love to have you come out of the woodwork and mingle.